In the banking industry's traditional infrastructure, many branch offices connected to a mainframe at the central bank. The central bank used one or more IBM mainframes with separate communication controllers to connect point-to-multipoint to remote terminal controllers supporting 32 IBM terminals. At first, the communication took place via leased lines using half-duplex modems with Bisynchronous Communication (BSC). 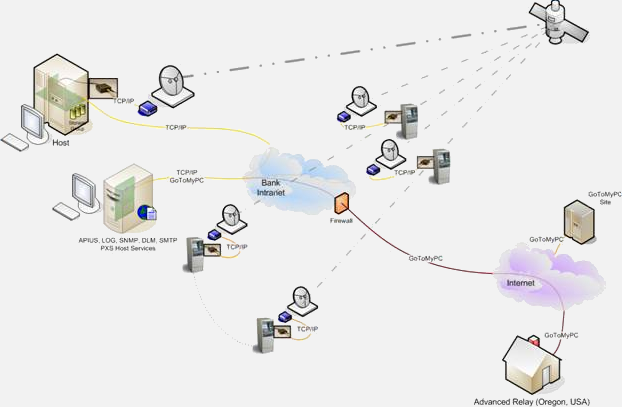 Later IBM introduced System Network Architecture (SNA). In the process, they made one of their greatest contributions to information technology by introducing Synchronous Data Link Control (SDLC), a bit-synchronous protocol. It was adopted by the ISO as HDLC. HDLC is still widely used in legacy technology (X.25, NRM), but is also used in current communication protocols in V.42 modems (LAPM), in DSL and in USB. The huge investment required to replace distributed business applications written in COBOL and using DB2, combined with the lack of qualified mainframe software developers, will ensure the mainframe's continued use. Over the years, bank branch offices have undergone major alterations with the introduction of special control unit emulators, PCs emulating 3278/3279 terminals using the same coax or twinax cable connection to the 3274/3276 control unit. 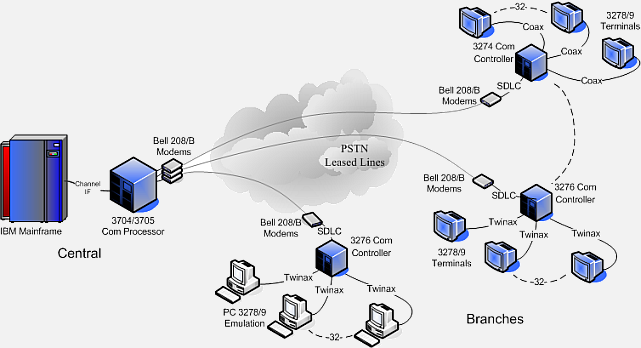 Once LAN technology became available, a specialized server on a LAN replaced IBM control units. LAN workstations replaced IBM terminals. Where distributed SNA applications were in use, SNA servers acting as agents to the mainframe replaced them. Microsoft's SNA server is one example. SNA normally used expensive leased lines, dedicated private phone lines and modems. The European PTTs pushed for a less expensive solution using the services of X.25 Packet Switching Data Networks (PSDN). To enable SNA connections, IBM introduced the Qualified Logical Link Control (QLLC) protocol interface between SNA and X.25. Connected directly to 37XX communication controller, the PXSe can tunnel the X.25 or SDLC traffic through TCP/IP to the remote SNA server. A PXSe client module (software-only) at the remote site will remove the TCP/IP envelope and pass the traffic to the SNA server. As above, but if X.25, the PXSe can remove the X.25 protocol, and tunnel only the SDLC traffic. 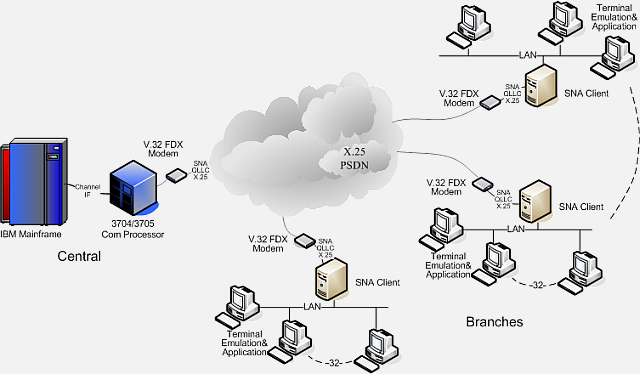 The SNA server could reside inside the PXSe, remove the SNA protocol, and forward only the user data via TCP/IP to a server or workstations. This will require that the SNA application use a socket interface. Banks provide ATM access via their branch offices, where the ATMs are wired to the banking data network. Many ATMs still use synchronous interfaces such as X.25, some even Bisynchronous. For maintenance reasons, banks would like to connect these ATMs to their intranet. 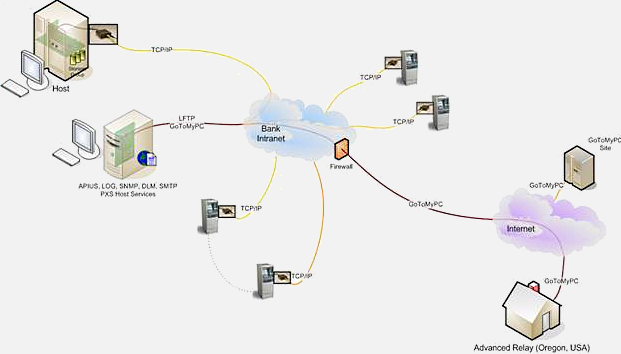 Many requests we receive from banks are therefore to exchange the synchronous interfaces on the ATMs for TCP/IP. Because there are generally many ATMs, the solution has to be cost effective. In general, ATMs use a 1-line RS-232 interface. Our PXSe/ATM is a low cost version of our PXSe, and operates as a synchronous to TCP/IP gateway. 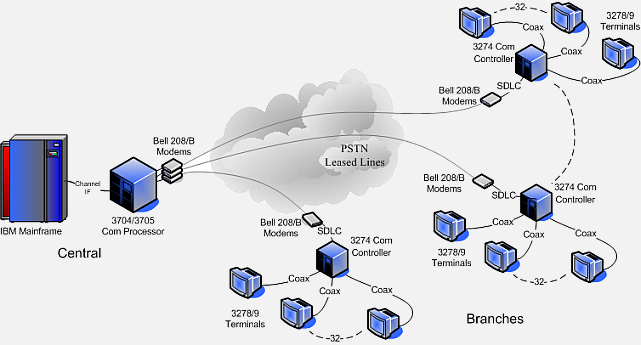 Because the synchronous protocols are terminated locally, the connections are faster as well. Many banks today would like to locate their ATMs in places other than branch offices, such as in shopping malls, train stations, airports and downtowns. 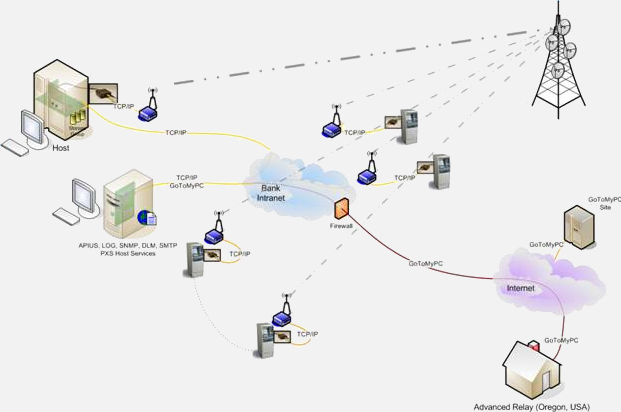 One option is to use the wireless cellular networks for the communication between ATM and the closest branch office or directly to the main office. The PXSe has the option to support high speed cellular interfaces, such as GSM, GPRS/EDGE/HSPA/CDMA and EV-DO. In situations in which the local infrastructure does not support cellular communication, satellite connections are an alternative. (See Bank of Agriculture, Thailand application story.) Advanced Relay supports interfaces to the ORBCOMM low-earth orbit satellite network.